The scrub plane is also known as a model 40 1/2. It has similarities to other hand planes, but some distinct differences as well. This tool is used primarily for quick gross stock removal, as opposed to many planes that are usually set for fine finish work. With this in mind, the mouth has a very wide opening, to make certain the thick shavings will not jam. 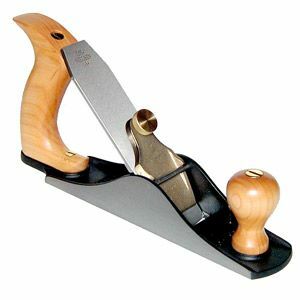 This plane can be used both on the face of boards as well as for edges. Normally the scrub plane is used between 45 degrees and 90 degrees to the grain direction. With the heavy cut of this tool, it can be problematic to use this plane with the grain. Unless the grain is extremely well behaved, significant tear-out is often a result. I’ve had customers ask why they should buy yet another plane when they already have a Jack plane or a Fore plane set up with a nice wide mouth. When you look at the difference in the irons, I think it will become more obvious why the Scrub plane is an excellent addition to the regular kit. The iron on the Scrub plane is 1 1/2” wide, versus 2” on the #5 Jack or 2 3/8” on the #6 Fore. When working with such a heavily exposed blade, the amount of wood ultimately fighting against the user can be significant. The Scrub plane’s narrower iron allows a deep cut while not overwhelming the user. If you set the blade of the #5 or #6 for the same depth of cut, the width and ultimately the amount of wood removed will make it much harder to handle the cut. One of the notable differences in the scrub plane is the fact that it does not have any mechanical adjustment for depth of cut. In this way it may seem more similar to wooden planes than most metal planes. There is a cap iron, with thumbscrew, that applies pressure to keep the blade at the desired depth of cut. When first learning this plane’s idiosyncrasies, a good starting point for the depth of cut is to place the plane on a flat surface, referencing the cutting iron with the sole. Starting more shallow is my preference, then apply light taps to the back of the iron to advance the blade in a controlled fashion. Once you become more comfortable with the plane’s behavior, you can sight down the sole to set a reasonable starting point for the depth of cut. Obviously, the less (as in less blade out) is more idea can still be a useful guideline even for the initiated. The cutting edge of the iron is ground with a 3” radius, which takes a very scalloped cut. The means are different, but the end result surface can be similar to that left from carving gouges. There are a couple of ways to sharpen the iron for the scrub plane (see the youtube video on this subject). If you prefer to hand sharpen, it is easy enough to reference the bevel on your sharpening media, while essentially working the blade both across and pulling it towards your body. This will allow the full radius to make contact with the sharpening equipment. Just remember that a burr is the sign you’ve worked enough on the bevel side. The burr should be removed, after the bevel is sharp, by working the back of the iron on the sharpening media. The Charlesworth ruler trick is again a time saver. The iron is wide enough that it can also be held in many side-clamping honing guides. The guides with narrow wheels will accommodate the range of motion needed to sharpen the complete radius, while providing a good reference. Using a scrub plane can allow extremely rapid stock removal, allowing efficient progress towards a defined dimension or reference surface. This is especially useful when moving from rough timber, working through other categories of planes (Jack, Jointer, Smoother..) to a final finished piece of lumber, or when dealing with the removal of large amounts of waste wood. Come give one a test drive at one of our events. You might just be surprised at how useful a scrub plane can be, and how you’ve gotten by without one in your kit. I hope to see some of you at one of our upcoming events, listed on the Lie-Nielsen website. To take a closer look at the scrub plane, click here. Woodshop Problem-Solving: Now What Do I Do? June 2011 Wood News: Now Available!